Including on a B-type BCD encoder chip, multi-channel scanning loop segment word driver, but also a static RAM 8 * 8 for storing each data. Only one external register is used to set the segment current of each LED. A convenient four-wire serial interface can connect general-purpose microprocessor. Each data can be addressed in the update do not need to rewrite all of the display. MAX7219 also allows each user to select a data coding or non-coding. 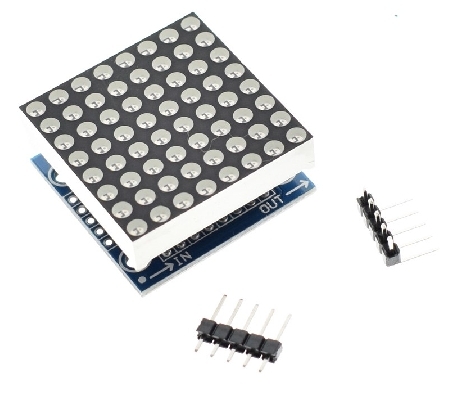 The entire device contains a 150μA low-power shutdown mode, analog and digital brightness control, a scan-limit register allows the user to display data bits 1-8, and one for all LED luminescence detection mode. It requires only three IO ports to drive a dot matrix! No flicker when the dot matrix display! Support cascading! 1. The left side of the module as an input port, an output port on the right. 3. cascading multiple modules, input and output termination CPU, input the output end of the second module of the first module, the first two modules of the first three input termination module, and so on. ..